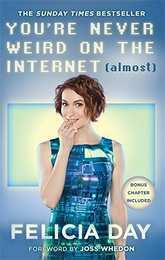 Some of you will know and love Felicia Day, some of you will vaguely recognise her face from the odd American TV series here and there and the internet, the others will have no idea who she is and wonder why on earth you are now reading a review for her autobiography. For the first group, you want this book, it's a wonderful insight into her life, without being the usual celebrity namedrop anecdote affair. She shares her strange upbringing, struggle with depression, starting of an internet media company, and making of The Guild. For the second group, check out one of Felicia's YouTube videos, if you find her remotely funny and likeable then you'll love her book. If you find yourself in the third group, stop reading now, you are dead to me. Unless you have a teenage daughter who needs some inspiration, in which case, welcome back and buy her this book! These days we are used to web series, but it wasn't always so. One of the first of these was The Guild, shot on an amazingly low budget, and an even more amazing list of cashed in favours, it ran for a total of 6 seasons before going into stasis. Felicia created and wrote the series after falling into a heavy game addiction with the online game World of Warcraft, producing something anyone who has ever played any MMO can relate to. But this isn't the usual stereotypical tale of a struggling genius who was shot down by Hollywood time after time, and then managed through adversity a meteoric rise to become queen of the internet space station. No, this is a whole new modern tale of a talented artist who just wants to express herself, and was shot down by Hollywood time after time, then managed through adversity a meteoric rise to become a target of internet bullies who don't believe a remotely attractive woman can be a gamer. In a world where Angry White Internet Males (aka AWIMs) still feel it's completely okay to publically objectify women who make and/or appear in YouTube videos, and denigrate them for having any opinion on gaming, Felicia and people like her are charging on regardless, and just putting out their creative content for us to enjoy. Oh, and I did think about halfway through this book, I'm really enjoying this, I'm going to write a review before I finish it… and then before I knew it… I'd finished it. And that… probably tells you all you need to know.